Banks are often under greater regulatory scrutiny than companies in other sectors, and that trend is likely to continue. 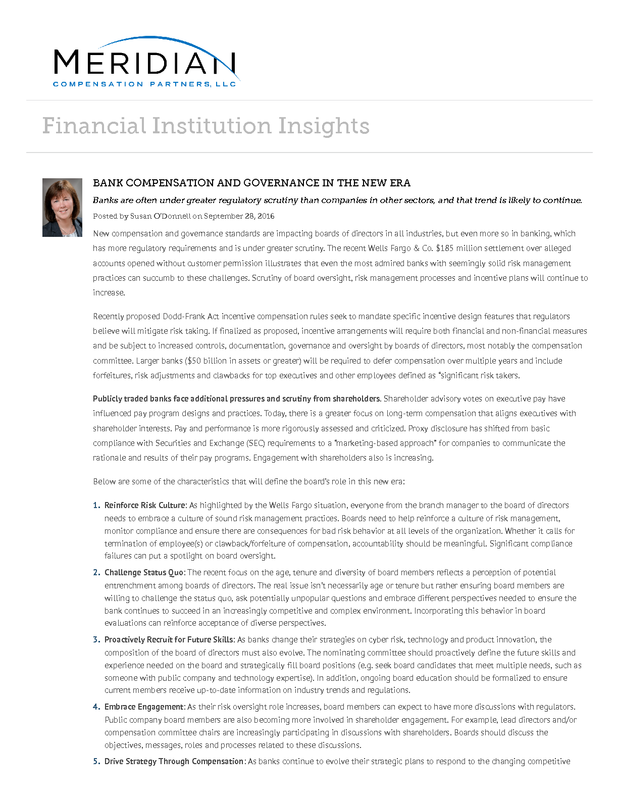 New compensation and governance standards are impacting boards of directors in all industries, but even more so in banking, which has more regulatory requirements and is under greater scrutiny. The recent Wells Fargo & Co. $185 million settlement over alleged accounts opened without customer permission illustrates that even the most admired banks with seemingly solid risk management practices can succumb to these challenges. Scrutiny of board oversight, risk management processes and incentive plans will continue to increase. Recently proposed Dodd-Frank Act incentive compensation rules seek to mandate specific incentive design features that regulators believe will mitigate risk taking. If finalized as proposed, incentive arrangements will require both financial and non-financial measures and be subject to increased controls, documentation, governance and oversight by boards of directors, most notably the compensation committee. Larger banks ($50 billion in assets or greater) will be required to defer compensation over multiple years and include forfeitures, risk adjustments and clawbacks for top executives and other employees defined as “significant risk takers. Publicly traded banks face additional pressures and scrutiny from shareholders. Shareholder advisory votes on executive pay have influenced pay program designs and practices. Today, there is a greater focus on long-term compensation that aligns executives with shareholder interests. Pay and performance is more rigorously assessed and criticized. Proxy disclosure has shifted from basic compliance with Securities and Exchange (SEC) requirements to a “marketing-based approach” for companies to communicate the rationale and results of their pay programs. Engagement with shareholders also is increasing. Reinforce Risk Culture: As highlighted by the Wells Fargo situation, everyone from the branch manager to the board of directors needs to embrace a culture of sound risk management practices. Boards need to help reinforce a culture of risk management, monitor compliance and ensure there are consequences for bad risk behavior at all levels of the organization. Whether it calls for termination of employee(s) or clawback/forfeiture of compensation, accountability should be meaningful. Significant compliance failures can put a spotlight on board oversight. Challenge Status Quo: The recent focus on the age, tenure and diversity of board members reflects a perception of potential entrenchment among boards of directors. The real issue isn’t necessarily age or tenure but rather ensuring board members are willing to challenge the status quo, ask potentially unpopular questions and embrace different perspectives needed to ensure the bank continues to succeed in an increasingly competitive and complex environment. Incorporating this behavior in board evaluations can reinforce acceptance of diverse perspectives. Proactively Recruit for Future Skills: As banks change their strategies on cyber risk, technology and product innovation, the composition of the board of directors must also evolve. The nominating committee should proactively define the future skills and experience needed on the board and strategically fill board positions (e.g. seek board candidates that meet multiple needs, such as someone with public company and technology expertise). In addition, ongoing board education should be formalized to ensure current members receive up-to-date information on industry trends and regulations. Embrace Engagement: As their risk oversight role increases, board members can expect to have more discussions with regulators. Public company board members are also becoming more involved in shareholder engagement. For example, lead directors and/or compensation committee chairs are increasingly participating in discussions with shareholders. Boards should discuss the objectives, messages, roles and processes related to these discussions. Drive Strategy Through Compensation: As banks continue to evolve their strategic plans to respond to the changing competitive landscape, it is equally as important to select incentive measures that reflect and support these goals. The compensation committee should ensure the portfolio of metrics used in the annual and long-term plans communicate to participants, regulators and shareholders how performance is measured and what will be rewarded. Without alignment between goals and strategic plan, the bank could be expending dollars inefficiently and potentially motivating the wrong behaviors. These are just some of roles for the board in a post-financial crisis era. Use this list to start a dialogue on how your board’s composition, processes and oversight might need to change to adapt to the new environment. 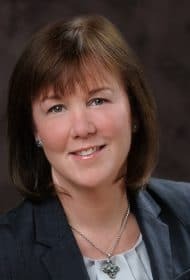 Susan O’Donnell is partner for financial services at Meridian Compensation Partners, LLC, working out of the Boston office.